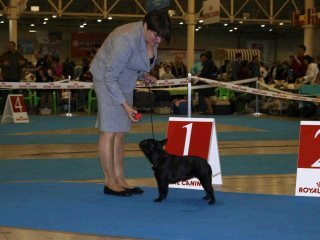 and his Greathgrandmother Multich Dauløkke´s Nordique Haut-Couture was in Vet class and she was selected as 2. best female among al those beautiful young compititors. 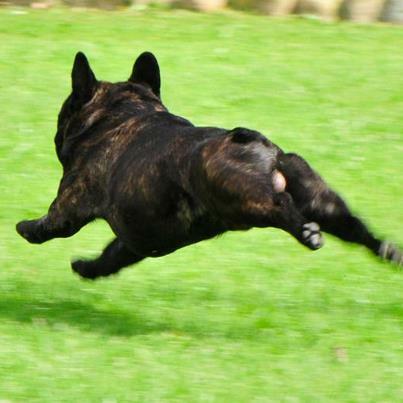 ;-) weeee haaaa ! 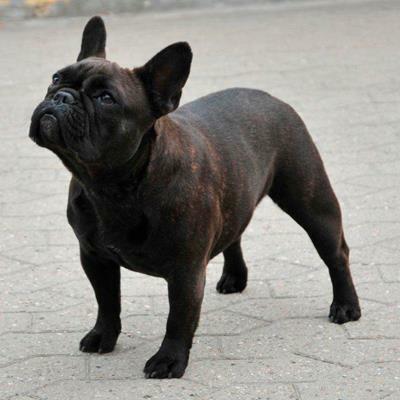 Congrates to my "grandson" Zecudas Fantom aswell . KLBJCH KBHV12 Dauløkke´s Sartre le Royal BOB CAC. KLBJCH Dauløkke´s Sorbe´du Paris BOS2. Judges Jens Myrman SE - Sara Nordin SE. 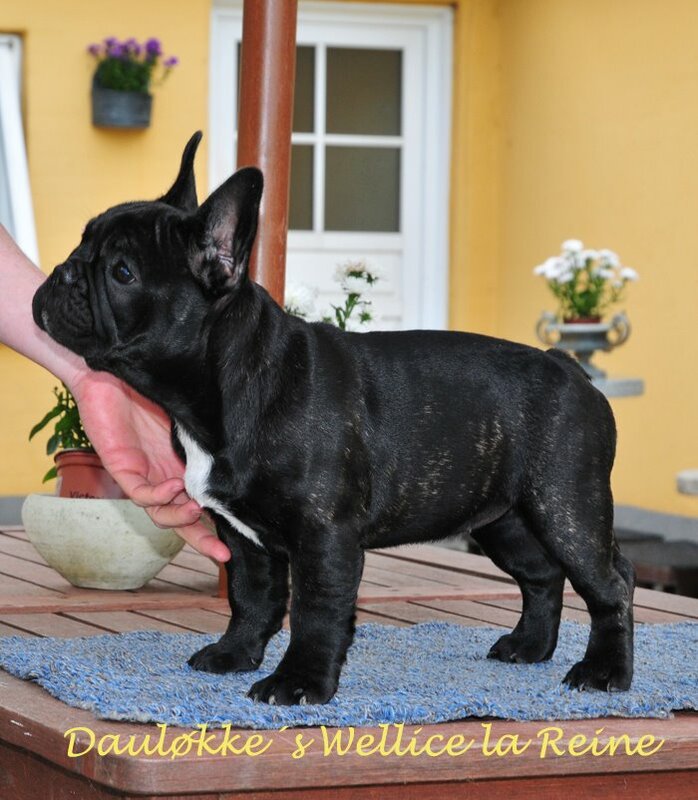 Babyclass DAULØKKE´S WELLICE la REINE BOB !!! 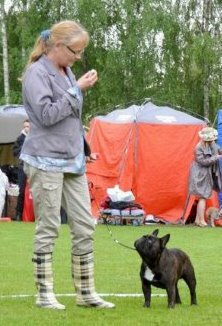 My very best Veteran girl MultiCH Dauløkke´s Nordique Haut-Couture was selectet BEST of al FEMALES BOS... gosh that was tuely a great honor :-) that i deeply appriciated . DAULØKKE- Trademark of Quality . 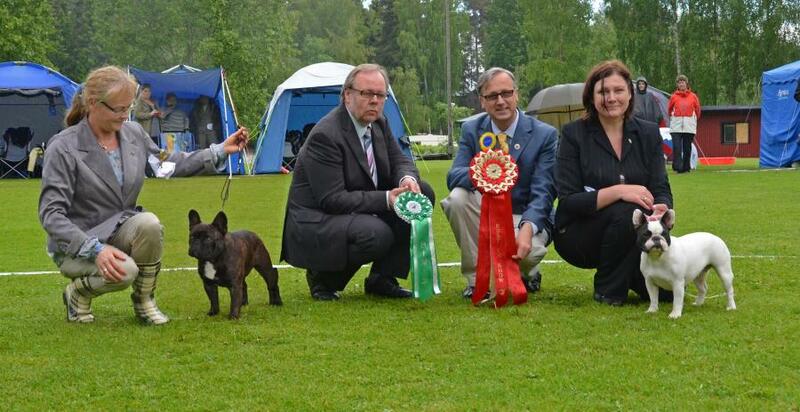 Pictured is BOB Baby DAULØKKE`S Wellice la Reine proudly co- owned with Jette G Hanssen . 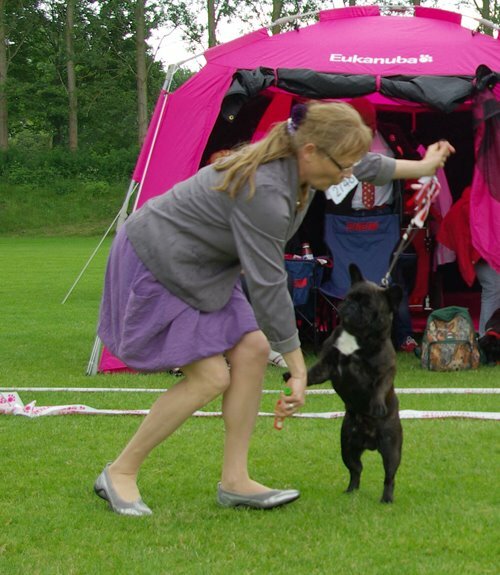 09-06 Swedish French Bulldog Club 30-year Jubileeshow 2012 . 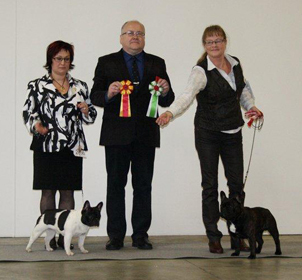 My young Dauløkke´s Sartre le Royal 1 exl CAC and BOS again. 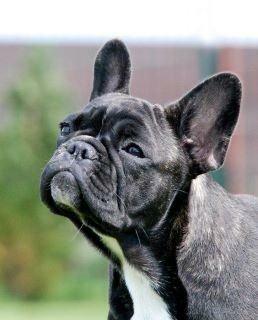 Bourbon Rose By Gernada 1 exl CAC BOS 2, and now SUCH -DKCH titel. CLUBSHOW DK 24/6-12. Judge :Mrs Penny Rankine-Parsons UK. DAULØKKE`S SARTRÈ le ROYAL EXL1,CK,BOS1, CAC, Klubjrcac, BOB :-) and now KLBJCH. Dauløkke´s Quo-Vadis 2 exl,ck, BOS 4. Dauløkke´s Sorbé du Paris 1 exl,ck,BOS 4, res-cacib. Dauløkke´s Urzula 2 exl,ck, res-cac,BOS 2. 02-06-2012 Int -Show in Neumünster . Judge : Tamas Jakkel HU. Judges was Carsten Birk DK - Alex Krasilnikoff DK - Gordon Drummond UK - Jari Laakso SU. The weekend as WDS 2012 was running , i had to chose to stay home for a "good" reason . 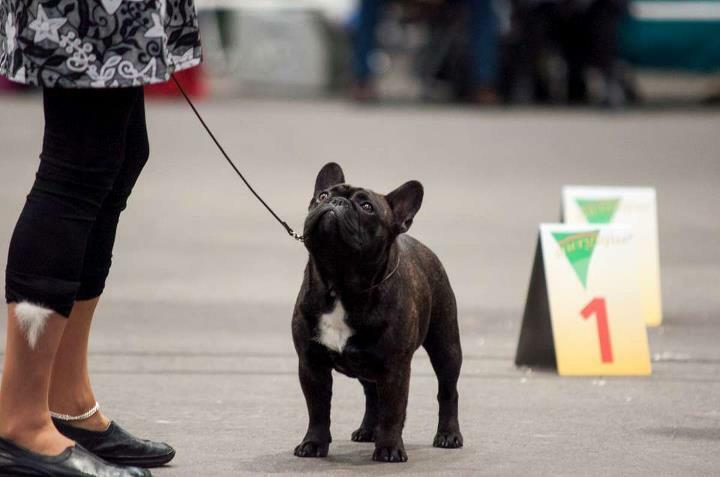 We showed ouer dogs on the Danish Specialty . 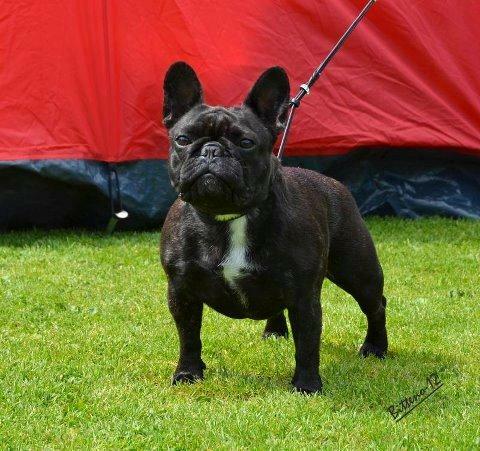 DKCH SuCH Dauløkkes Quo-Vadis Exl 1 in CH class club -CAC and BOS . MultiCH Dauløkke´s Nordique Haut-Couture BEST VETERAN :-) and BOS 4. Dauløkke´s Sorbé du Paris Exl 2,CK Interm cl . DKCH SuCH Dauløkke´s Quo-Vadis Exl 1 Ch Class, Club CAC BOS 4. 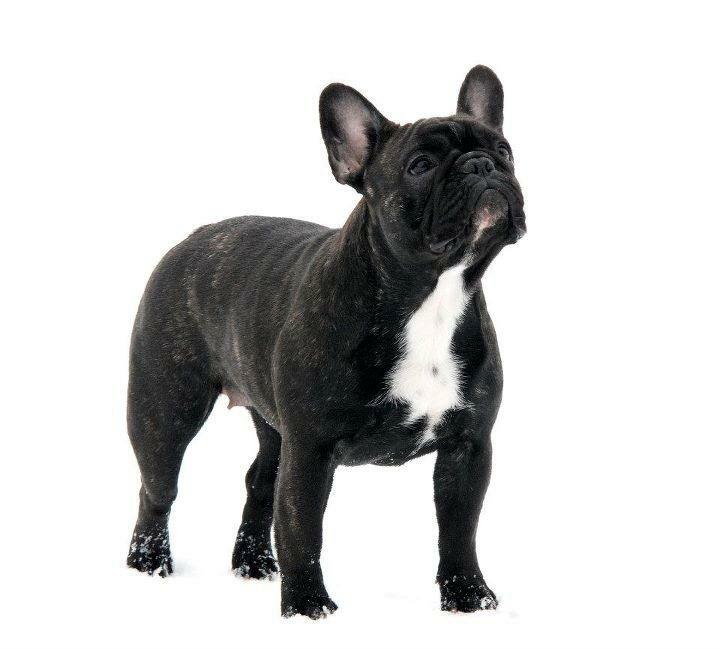 Multi CH Dauløkke´s Nordique Haut - Couture BEST VETERAN . 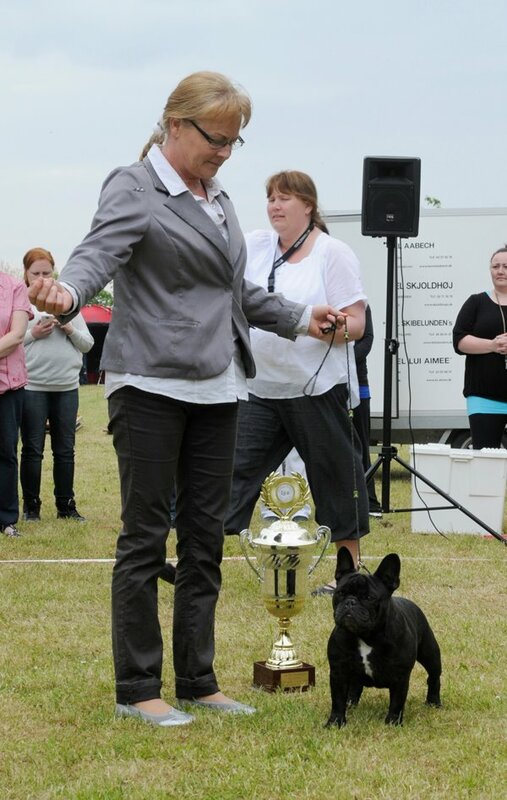 I chose to put up a resent picture of Dauløkke´s Nordique Haut-Couture posing with her trophy for her title :BEST VETERAN 2011 .. i think.... you will know why i chose so . 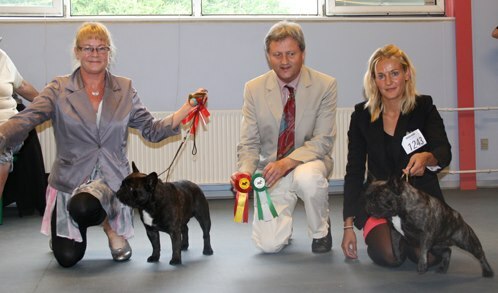 DAULØKKE`S SARTRE LE ROYAL EXL1 JUNGHUND BOB JUNGHUND JRCAC. BOS and finally BOB !! :-) ;-) Thanks to my son Freddie, for driving miss Daisy LOL . Nice to see you all again . 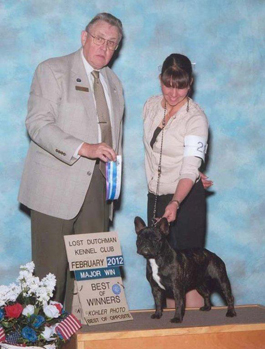 Daulokke’s Uma-Lou – Class Winner, 1-vp, Best Puppy.. It was a very interesting and great show. I notice with satisfied that many exhibitors already announced their results as expected : Congrats to to you al. 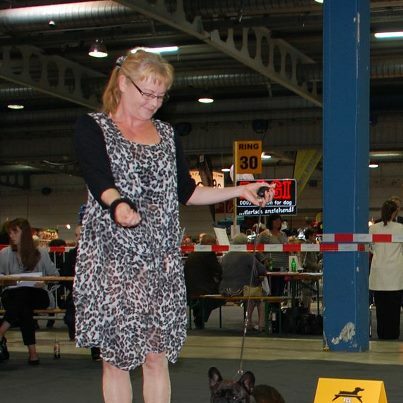 To my attention i see that most all of the dogs placed in top of the classes is presenting my breedwork for generations ..so i let my self be proud of this , althrough i know it is a hard bisquite for some .. i felt that in the hallway at the show .... so that´s how it is. I might look fragile but i survive !! 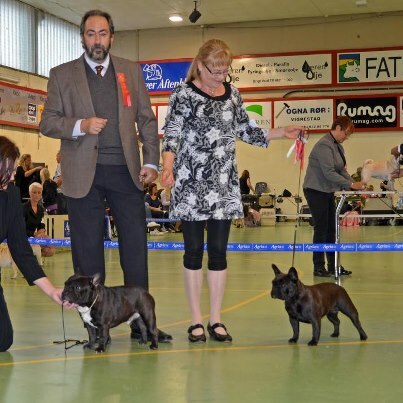 So now it is my pride to tell that my two youngsters Dauløkke´s Sartre le Royal and Dauløkke´s Sorbé du Paris both was arwarded with Jr-CAC and that Sartré also recieved the CAC both 3 BOS . 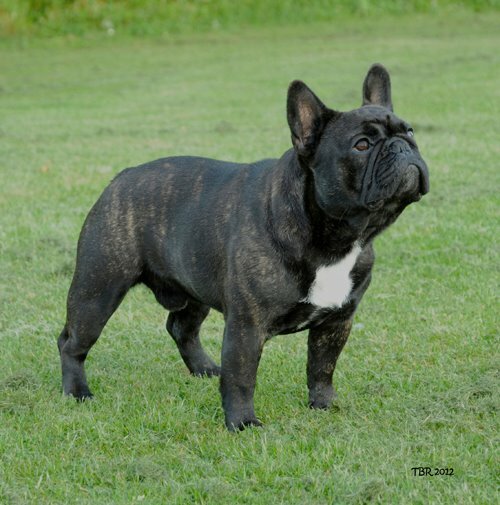 (Dauløkke´s Aristobeau du Tex - Joy of Night and Joy ) and Dauløkke´s Zuzette du Nord, thanks to Kim for his exl handling. JuniorClass: Dauløkke´s Sartre le Royal, EXL1 CK, CAC, BOS. Dauløkke´s Simone de Beauvoir, Best Junior.